"This recipe includes everything you need for a sushi dinner party for about 10 people. It Includes California rolls, Boston Rolls, Lobster rolls, tempura eggplant and avocado rolls, pesto and egg rolls, and shrimp and asparagus rolls (we did not include any raw ingredients, since our people are a bit squeamish and reluctant to eat anything raw). Mix and match the fillings, as desired. Serve with pickled ginger, wasabi paste, and soy sauce." Bring water and rice to a boil in a large pot. Reduce heat to medium-low, cover, and simmer until the rice is tender and liquid has been absorbed, about 25 minutes. Remove pot from heat and keep covered for 10 minutes. Stir 5 1/2 tablespoons rice vinegar, sugar, and salt together in a microwave-safe bowl; microwave until vinegar mixture is warmed, 30 to 45 seconds. Stir well. Add vinegar mixture to rice and toss thoroughly to coat each grain of rice; cool completely. Heat 1 teaspoon vegetable oil in a small skillet over medium heat; cook eggs in hot oil until firm, 3 to 5 minutes. Transfer eggs to a plate and cut into strips. Heat 1 tablespoon vegetable oil, sake, 1 tablespoon soy sauce, and sesame oil in a skillet over medium heat; fry eggplant in oil mixture until softened and lightly charred, 5 to 10 minutes. Transfer eggplant to a paper towel-lined plate. Mix carrot, 1 tablespoon rice vinegar, and 1 tablespoon soy sauce together in a microwave-safe bowl; microwave until carrot is softened, 1 to 2 minutes. Drain. Bring a large pot of lightly salted water to a boil; add asparagus and cook until bright green, 2 to 3 minutes. Drain and immediately immerse asparagus in ice water for several minutes to stop the cooking process. Drain. Cut avocado into 8 slices and drizzle lemon juice over slices in a bowl. Lay nori sheets on a flat work surface, wet hands, and spread 3/4 to 1 cup rice onto each sheet. Press rice into a thin layer, leaving 1/2-inch exposed nori on 1 long side. For California rolls, layer crabmeat, avocado, cucumber, and carrot atop one another in a thin strip along the edge opposite the uncovered edge on 3 nori sheets. For eggplant and avocado rolls, layer eggplant and avocado atop one another in a thin strip along the edge opposite the uncovered edge on 3 nori sheets. For pesto and egg rolls, spread pesto in a thin strip along the edge opposite the uncovered edge and top with egg slices on 3 nori sheets. For shrimp and asparagus rolls, layer shrimp and asparagus atop one another in a thin strip along the edge opposite the uncovered edge on 3 nori sheets. Transfer 1 prepared nori to a bamboo sushi mat. Use the mat to roll the nori and rice around the filling toward the exposed nori edge, squeezing gently. Wet the exposed nori edge and seal the roll. Slice each roll into 8 pieces. Repeat with remaining prepared nori. Learn the best way to make sushi rice. Of course there are many other kinds of sushi rolls. 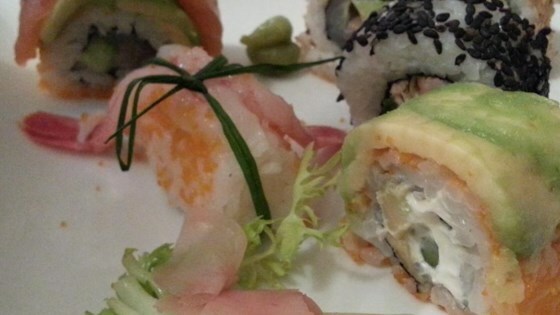 Get ideas for fillings by looking at the ingredients listed on a menu from a sushi restaurant. Also, try the fillings in different combinations. We mixed and matched, and almost any combination of fillings seemed to work. One person did not like the nori, so we left the nori out of a roll for her. If you do this, be sure to use enough rice and pack it tightly while rolling or it will fall apart. To make Boston rolls, follow the California rolls instructions, substituting shrimp for crabmeat. To make lobster rolls, follow the California rolls instructions, substituting lobster for crabmeat. Options: sprinkle sesame seeds on rice or add a light smear of wasabi before rolling. Substitute mango for avocado. For inside-out rolls (rice on the outside) flip the nori over after applying the rice, so that the rice-side is down before filling and rolling. The nori sheets can soften while preparing the rolls. I always prepare each roll from start to finish before starting the next roll. People has never ate sushi enjoyed it.